Judeopundit: Naqdi: "nothing but burning the White House and hanging the US commanders responsible for this cowardly action can relieve the Muslims' pain"
Naqdi: "nothing but burning the White House and hanging the US commanders responsible for this cowardly action can relieve the Muslims' pain"
A top Iranian military commander said the US helplessness in the confrontation against Islam is the real cause underlying the burning of the Muslims' Holy Book by American soldiers in Afghanistan, and stressed that nothing but burning the White House and hanging the US commanders responsible for this cowardly action can relieve the Muslims' pain. 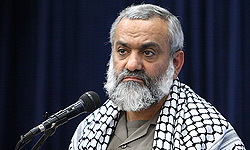 "The US has committed such an ugly action and burnt Quran because of the heavy slap it has been given by Islam," Commander of Iran's Basij (volunteer) force Brigadier General Mohammad Reza Naqdi said on Saturday. He stressed Muslims' sensitivity to the crimes underway in Afghanistan by the US forces, and said Muslims do not accept the US apology, because it makes numerous military mistakes and then just asks for the Afghans' apology, and this is not acceptable. "Nothing but burning the White House can relieve the wound of us, the Muslims, caused by the Burning of Quran in the US," he underscored. The man is a rising star, no doubt about it. Death of a 13-Year Palestinian Boy You Likely Won’t Read About - You may never hear about the death of 13-year-old Muhannad al-Baz. Eighth light - Almost forgot! "Foreign Personage Lauds Kim Jong Il's Feats"
LA Times: "Testing pot in a legal vacuum"